This modern home from home bungalow boasts two bedrooms (double and twin), a walk in shower room, modern kitchen (with washing machine & dishwasher) and living area with a bed settee (which will sleep one adult or two children), together with a private pool (can be heated for an additional cost), bbq area and sun terrace. Air conditioning credit is provided for your stay, this is adequate if used economically, if more is required this can be purchased locally. A meet and greet service is provided to take you through all aspects of the property, they will also be able to provide you with information on the local area and answer any questions you may have. Cleaning costs and Pool Heating is not included in our prices. Cleaning is a compulsory cost of 85 Euros which is payable on arrival. The pool can be heated for your stay, this is charged at £50 for the first three nights, then £10 per night after this (for example a weeks cost for pool heating is £90 an additional week is £90 + £70) if the pool heater is required you need to inform us at least one week before you travel so we can arrange for you to make the payment and then to have it switched on and heated before your arrival. If required we can arrange an airport pick up and drop off for an additional cost. Check in is 4pm & Check out is 10am. We are a family from South Wales who have bought this property between us, the age range is from 0 - 92 and we all love the area. 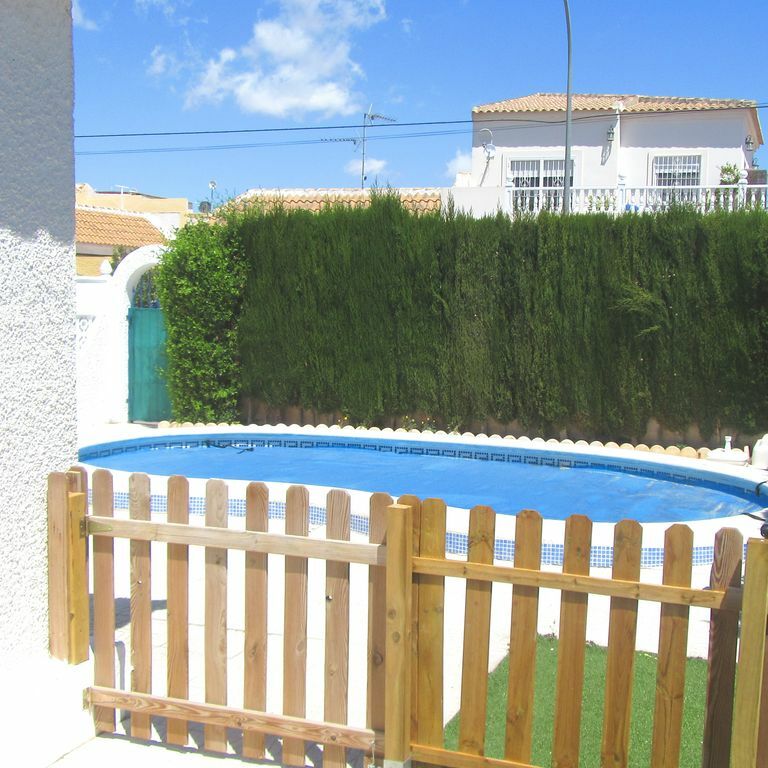 We've discussed buying a property in Spain for years and looked at lots of different areas, this was our favourite location as we can walk to everything including the Mar Menor beaches, bars and restaurants and don't need to have a hire car. Also having a private swimming pool was a must for us. The property has been kitted out to suit our children and to ensure their safety. Air conditioning in the living room and master bedroom. Bedding, towels and beach towels provided, you will need to provide your own bedding for the travel cot. Large fridge for you to use. These are a additional extra if required. Plenty of dishes and utensils, including childrens plates, bowls and cuttlery. There is a unit to play your ipod. The playstation can also be used as a DVD player. The pool area is at the front of the property, this is fenced off from the BBQ area which is at the rear of the property. There are 3 steps to get in the property. A cleaning and laundry fee is payable on arrival, the cost of this is 85 euros. The wonderful beaches of the Mar Menor, shops, bars & restaurants are a 10 to 15 minute stroll away. There are also large supermarkets (including Lidl) a 5 minute stroll away. The nearest local pub (with crazy golf) is less than 5 minutes away..
Los Alcazares has a fantastic coastline with over 7 kilometres of sandy beaches which give direct access to the warm waters of the Mar Menor. The promenade running parallel with the beach is great for walking and cycling. The town centre is relatively spread out and has a selection of shops. Markets are held Tuesday morning in Los Alcazares and in Los Narejos on a Saturday morning. If that isn't enough there are always the two golf courses of La Serena and Roda or the Golf Delux miniature golf course.